This was a harrowing but compulsive listen. Tara grew up in a fundamentalist Mormon household in Idaho, and somehow, despite no education at all, no support, abuse at the hands of her older brother, and insane indoctrination about the Illuminati, went on to her her Ph.D. from Cambridge. It's obviously fascinating how someone could get from that particular Point A to that Point B, and provides an educated, informed view into a closed-off community. It also provides interesting insights into the mind of someone who has been physically and emotionally abused, and why people keep going back. It had a lot of, "Oh Honey" moments in it, where I wanted to hug her and then lightly smack some sense into her. Tara's mind must be an amazing place. To have her astonishing intellect, her impressive insights, and her deep understanding of a world most intellectuals dismiss, is to see with new eyes a situation one might assume they superficially understand, but in fact don't at all once you get beneath the top layer. I think most of us, who have not experienced abuse, have really and truly wondered why the abused don't just leave (especially if they're adults--Tara was still a child when her brother started to hurt her, and of course the emotional abuse at her father's hands started well before that.) 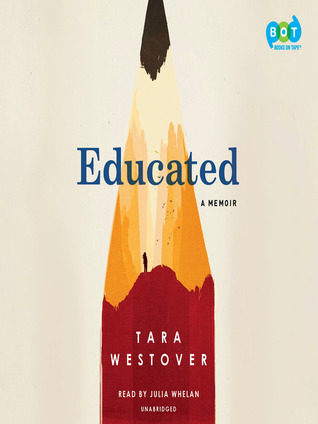 And for me that was the more interesting and more impactful revelation in this memoir, rather than how did a woman without even a rudimentary home education go to college and on to prestigious graduate schools. To me, the seminal scene was when she first arrived in Cambridge for a study abroad program as an undergrad and all the faculty and the other students, even the other BYU exchange students, seemed to sophisticated and worldly and confidant--until they were at a chapel where people could climb out of a window onto the roof. Then Tara was the only one who could boldly walk across with utter confidence, as her classmates and professors nervously skittered sideways like terrified crabs. When her professor asked her how she could stand in the strong wind, she pointed out that she could do it exactly as she would do it on the ground. No one ever asks you that on solid ground, no matter how windy it is. It's only the fear or falling that makes the wind seem treacherous. Her incredible perspective was eye-opening. I get the comparisons to The Glass Castle, but this book completely stands on its own. Tara's story is riveting, educational, and inspirational. The audio version really got me fully immersed. If you are baffled about how, in a family of 6 children who were not even home-schooled, three managed to get Ph.D.s, while the other 3 couldn't even manage to get GEDs, you've got to read this book. I bought this audiobook from libro.fm, which I subscribe to through Main Street Books in Davidson, NC. 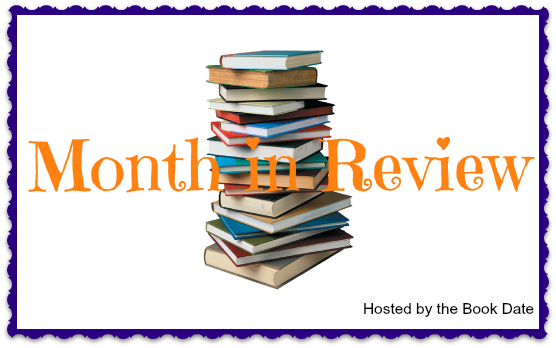 I try to read a little bit of everything, but there are always genres that fall at the bottom of my priority list, and of which I think I don't like an awful lot of the books they contain. A couple at the very bottom are alternative history and science fiction. But, the exception proves the rule! 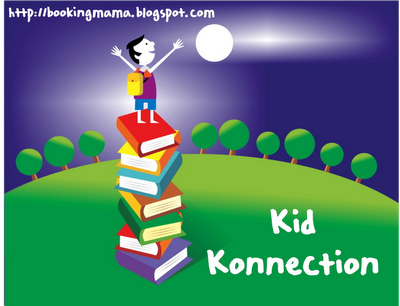 This particular book is both, and I LOVED it! Elma, a physicist, was a WASP in WWII. It is now 1951 and she and her husband, an engineer for NACA (the precursor to NASA), have left DC for the Poconos for the weekend. As he is getting another log for the fire, they see the brightest flash in the world outside. After less than a minute's discussion, thanks to their informed knowledge, they correctly presume it is a meteorite, and get the heck out of there while they still can. It has hit in Chesapeake Bay. Delaware is gone. Washington DC is gone. Most of Maryland is gone. Everything from New York City to Charleston is on fire. They flew in Elma's 2-seater to the cabin, so they are able to fly out, despite chunks of things falling from the sky unpredictably, and the closest airfield they can find to land at is Wright-Patterson in Dayton, Ohio. There, and later in Kansas City, the country attempts to put itself back together again. Luckily the Secretary of Agriculture was giving a lecture in the Midwest as he is the only surviving member of any of the three branches of government. But some people are whispering in his ear that the Russians must have had something to do with this. Elma's husband asks her to calculate the size of the meteorite and the force it would have taken to shift it off its course. In addition, she comes to a terrifying conclusion. In case it hasn't already occurred to you to think about the last time a meteorite hit earth (dinosaur extinction), she plots out the average temperature over the next few years, and when she gets to the point, around 10 years in the future, when the ocean starts to boil, the conclusion is inescapable: we have to get off this planet. Now. As you can guess from the name of the series, Elma wants to be one of the first "Lady Astronauts." The desperation and also the fact that NACA (and DC) were wiped off the planet, means there are more opportunities for women and for minorities. But it is still the 1950s. The book is so much fun! 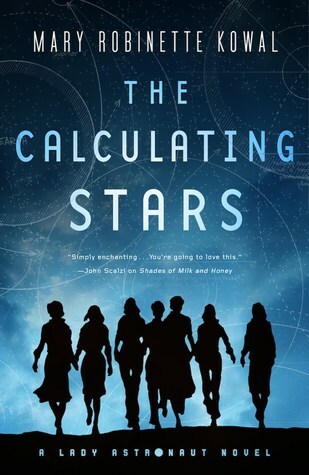 It's based on a short story that won a Hugo award, and when I read than, when I finished it, I felt in physical pain that it was over (I hate short stories and that one proved me right--just as I get into it and get to know the characters and their dilemma, boom, it's over. Wonderful short story. I just wanted it to be 300 pages longer.) It will be a wonderful beach read that is still very smart and one that rockets forward at great speed. And if, like me, when you get to the last page you howl "Nooooooo! ", you're in so much luck! The sequel comes out in just SIX WEEKS! Also, these are trade paperback originals, so they're at the less expensive price right out of the gate. You must go get this book now! Chadwick has been teased and bullied by Terry, who he likes to call "Nile Crocodile" (hoping that will catch on as a nickname), so he's thrilled when over the summer, he hears that Terry flunked and won't be in his grade next year. He puts a plan into action to try to slowly infiltrate the group of kids at the pool that includes the girl he likes. He doesn't move fast but by the end of the summer, the girl seems to sometimes know who he is, and he considers that a huge success. But then, he gets knocked two steps back when school starts and... Terry is there! Turns out Terry started the rumor himself, in order to fool Chadwick, who he knew would be shocked on seeing him on the first day. 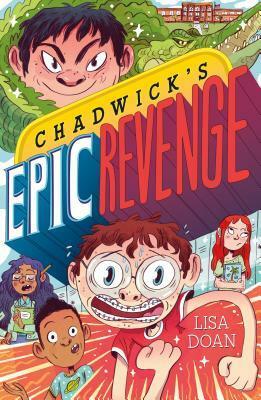 Chadwick is determined to get revenge. He was going to have the best year ever and now Terry is ruining it! Terry starts rumors about Chadwick that stick, and somehow Terry is even becoming popular and even, oh no, does the cute girl like him too? It's the worst! And Chadwick can't stand for it! With the help of his best friend he comes up with a plan. And it's epic. He'd just better hope it doesn't blow up in his face. And maybe he might also learn that bullying a bully just makes you... a bully. Is that really the best revenge? I got this book for free from my work, as it is published by Roaring Brook, a division of Macmillan. Like an awful lot of celebrities, especially ones in the performing arts, Retta didn't start out fabulous. But I was surprised by her background. Her parents are immigrants from Africa, and she's a first-generation American. She grew up in Northern New Jersey, not far from where I live now. And she worked very hard in school, and despite things being strict at home (and despite there being at times a LOT of relatives there), she was pretty well-liked, well-rounded (she was a cheerleader and did shot-put), and she was certain she was going to be a surgeon one day. Many people were skeptical of her choosing to go to Duke, as it was far away and in the South, but she was pretty happy there. So happy in fact, that she decided to try stand-up one night. After all, everyone said she was funny. And it went great. And she did it again. And eventually she was hosting the open-mic night at the comedy club. And she never went to medical school. She took risks, she moved away with pretty much just what she had in her car (which was then repossessed! ), she pursued a career that no one in her family understood, and she is a bigger African-American woman, so there were a lot of obstacles in her path. At one point, an HBO developer wrote a role for her on a series, but then she had to audition for it which was weird, and then SHE DIDN'T GET IT AND THEY WANTED TO STILL KEEP THE CHARACTER'S NAME "RETTA." (eventually they did change it and the show never got picked up anyway.) But seriously, not getting a role that is written for you and based on you, is a real blow. So when she got the part of Donna on Parks and Recreation, everything seemed pretty hunky-dory. And it pretty much was, although more than once Amy Poehler had to go to bat for her and Jim O'Heir (Jerry), who weren't considered "regulars" until Season 3. Even then, Amy really had to pull weight to get them included on an Entertainment Weekly cover with all the rest of the cast (and Jim was obscured by the title). Still, it was a great thing overall. 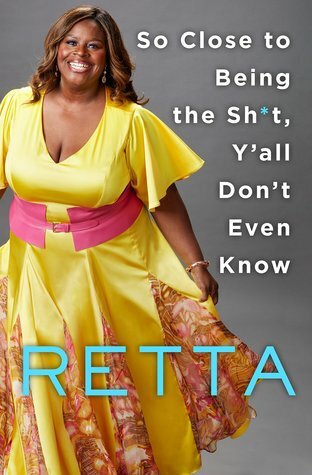 But you get the feeling that great things are still very much in Retta's future. While it was awesome portraying an African-American woman who flew in the face of many stereotypes, Donna was still a minor character. Retta is a leading lady. You can feel it radiating off every page. Her confidence and insouciance and her just plain old hilarity are screaming for their own sitcom. C'mon Hollywood, you can do it. In the meantime, we can read her quite funny book including amusing footnotes and lists (which she says her publisher insisted she had to include) about her purse addiction and how she's clawed her way up, but never forgot who she is or where she's from. This book is published by St. Martin's Press, a division of Macmillan, my employer. I broke one of my own rules and I regretted it. I try not to read series until they are all available. I hate waiting between books, I have a terrible memory, and then sometimes, like with this one, the book really feels incomplete and like a preamble. In Cottons, a warren of rabbits go to work every day in a mine, mining carrots which are then made into this magical substance which can do anything. But some rabbits are artists and make other things. 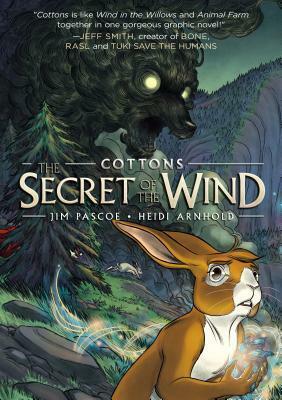 And then one rabbit discovers a secret object, like an amulet, which can do real magic. And just as the world-building wraps up, the book is over. And the character-building and the plot have just scraped the surface. I have a feeling that one day when all volumes are available (preferably published as an omnibus), this will be great, but in the meantime, it's just frustrating for me, although with intriguing and beautiful artwork. I can tell a great story is being set up, but I want to read it all nooooooooow! We have two cats, Doozy and Turkey. They are both extremely persuasive in their own ways. Turkey has learned that even though he is almost six, if he makes a tiny kitten meow, he's more likely to get what he wants. Doozy will actually put a paw out towards a food we have that she wants, as if to help direct us. And if you have a cat or six, you'll know what I mean. Do you feed the cats on your schedule, or on their schedule? Do you pet them (and more importantly, stop petting them) when you want to, or when they want you to? Have you ever stopped doing work in order to throw a ball or a mouse or shake a feathery thing? Did you really think, I want to take a break from work right now, or did your cat bring you that mouse and drop it at your feet? Not only are cats very persuasive, but they are very difficult to persuade. I have been unable to persuade Turkey to stop eating our clothes, so all closets must be kept tightly closed. When I need to lock him in my office for a while, such as when the exterminator was here spraying for ants, he will not be persuaded to relax and chill and hang out. Instead he will spend four hours staring at the door pensively. If you can persuade a cat to do things, you can persuade anyone. And who better to learn lessons of persuasion from, then your cat? Does he ever argue you into submission? Considering his lack of human language, I'll bet that's a big no. And yet, when I'm cleaning up the grass he has vomited on the carpet after he convinced me for the umpteenth time to let him go out in the yard and eat grass, and somehow he told me, don't worry, this time I won't throw up. I know he's the master of this skill and I am not. Mr. Heinrichs has written a serious, successful book about the art of persuasion. 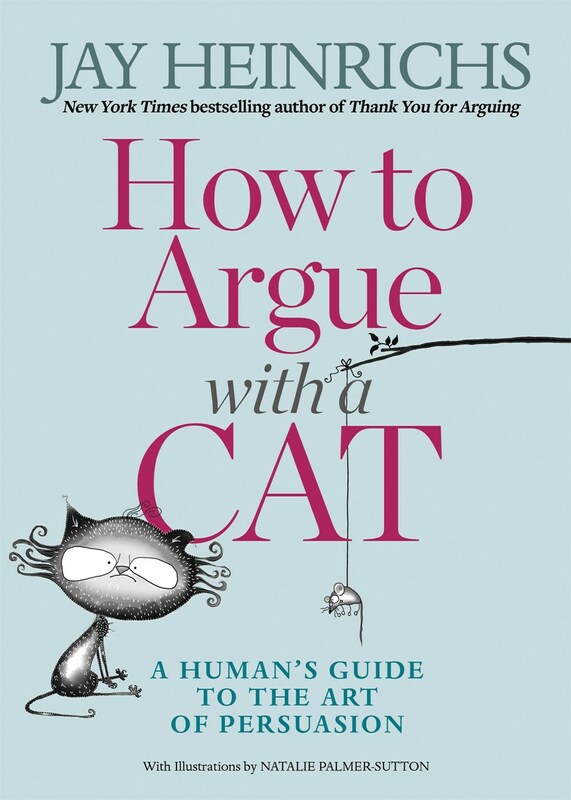 And here he has taken the same subject, and run with the metaphor, to make for a very accessible, highly entertaining book about silly cats and their ridiculous way (paired with hilarious drawings) which will in the end teach you how to be a more persuasive human, even if your cat will still always win arguments. But maybe now you can at least convince other humans to do what you want. Even if you can never convince cats. This book is published by Rodale Books, which is distributed by Macmillan, my employer. I don't know about you, but I like my history with a healthy dose of murder. I also like my science with a healthy dose of history and murder (science goes down harder so it needs two spoonfuls of sugar.) Added bonus for all involved if there's also mystery and snark. 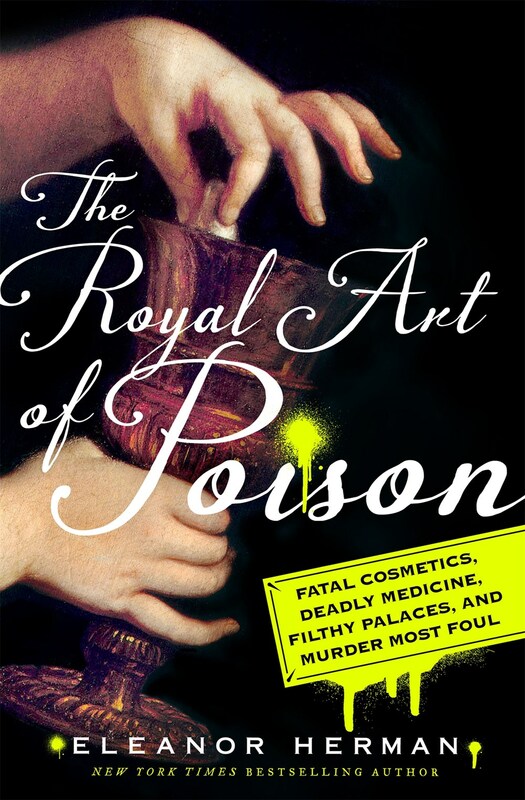 If all of this is sounding intriguing, you must read The Royal Art of Poison. It's not a silly book. The author really has done her homework. And she has pulled together lots of historical documents along with modern medical analysis and the occasional modern exhumation to try to piece together which royals may have been poisoned, which may have been poisoned accidentally (perhaps by their own hand through makeup, accidentally when people just didn't know certain things were poisonous, or even purposefully by well-meaning doctors trying to cure the royal of a preceding poisoning or other malady), and which may have died by some other medical issue, such as disease, that may have mimicked some symptoms of poison. Turns out to be a lot of all of the above. A lot of royals were accidentally poisoned one way or another. And some thought to have been poisoned weren't. This was a thoroughly enjoyable history of poisonings, attempted poisonings, accidental poisonings, and assumed poisonings. Much fun! I got this book for free through my employer, Macmillan, which is also the publisher. 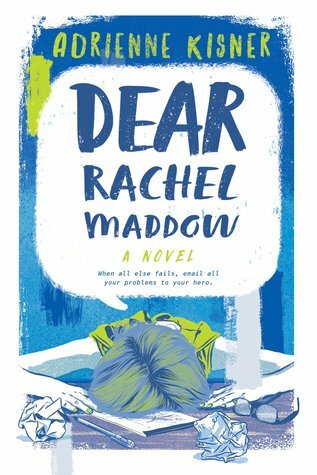 Brynn is assigned to write a letter to someone she admires, so she picks Rachel Maddow. To her utter shock, Rachel writes back! Now her teacher wants her to respond. Brynn's not so cool with that (especially because the teacher-suggested topics are dorky/bleh.) I mean, she does write back to Rachel Maddow--hundreds of letters--but she just saves them in her drafts folder and uses that format kind of like a journal. And through writing to Rachel, she starts to deal with her brother's death from a drug overdose last year, her subsequent banishment to a basement classroom for remedial students (she could not keep her grades up after his death), being dumped by her first girlfriend, and her terrible situation at home with her super-jerk of an abusive step-father. She's pretty wrung out by everything she's dealing with, and then one day, her ex comes along with one of the school jerks to ask Brynn to sign a petition. It seems that the school board is actually allowing a student representative to help pick the next superintendent, and the petition is to make sure the representative is the best possible, and therefore is an honors student. That's the last straw for Brynn. She decides she wants to beat him and if that means she has to run against him, she will, with the help of her friends in the basement, a new smart girlfriend, and possibly even Rachel Maddow (at least the Rachel Maddow in Brynn's head). Will this help Brynn pull her life back together? Will her life ever stop being a dumpster fire? Will she ever get her grades up enough to get back on the school newspaper? Things don't go exactly where you think they're going to go and they don't resolve in the way you'd predict, but they still resolve in a very satisfying and true-to-the-characters way, which I actually liked better than the predictable version in my mind at the beginning of the book. Brynn is profane, tries to be hard-hearted, and is in the end very endearing, and I think despite the setbacks she's had, she's setting herself up to live a full and satisfying life, and one where maybe Rachel Maddow is her penpal. Since I am at the end of a season, I have allowed myself a little break to read some non-Macmillan books. I also bought a couple of books, which I rarely do these days.